The multifarious award winning gospel singer paraded her musical prowess as usual with an energetic live performance for an hour which will definitely leave patrons who came to witness the event in nostalgia. 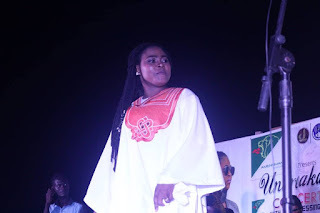 Dressed in an all white captivating African outfit , it was incessantly a one woman show for Joyce Blessing as she treated the thousands of audience present to a miscellany of her songs. Joyce Blessing performed popular songs of hers like ; Repent, Monko Moakyi, Di Asa, I Swerve You, Heavy Price, Boot 4 Boot, Agyebum, La Mia Praise and more. According to Patrons, the Unbreakable Concert has become the biggest gospel event which has ever been held in Wassa-Akropong and its environs. In appearance at the event were the chief of Wassa Akropong : Tetrete Okuamoah Sakyim including his sub chiefs and Queen Mother and other dignitaries in the town. The Unbreakable Concert was organized by King Ice Entertainment in collaboration with DaveJoy Productions.